Helping neurons find the other side of the brain: two ubiquitin ligases play an unexpected, non-degradative role at cell tips. Background: The leading edge of a migrating cell or the growth cone of an axon comprises a dense meshwork of short actin filaments which form protrusive structures called lamellopodia. A cell actively sensing its environment can also generate longer, exploratory finger-like projections called filopodia. Filopodia emerge from the actin meshwork in the lamellopodia and a key protein required for their formation is VASP (first identified in Drosophila as Enabled (Ena)) (1,2). VASP is an actin assembly factor that competes with capping proteins (that otherwise restrict the length of actin filaments in lamellopodia). Mechanistic details of how VASP does its job is of much interest to cell biologists. For example, we have learnt many details of how it achieves high processivity and cooperates with actin bundling proteins (3, 4) to create the elongated actin structures filopodia are composed of. Here, I highlight a recent preprint that reveals an interesting role for two ubiquitin (Ub) ligases in VASP regulation, in the context of the developing mouse brain. The Gupton lab has previously demonstrated a role for a Ub ligase TRIM9 in axon branching and filopodia dynamics (5) and has also characterised defects in behaviour and neuronal anatomy of mice lacking another ligase, TRIM67 (6). This preprint illustrates how these two ligases can functionally interact to control VASP activity in growing axons. These studies also expand our view of non-degradative functions of ubiquitinylation in cell biology and signalling (7-9). Key findings: Examining sections of the perinatal Trim67-/- mouse brain, the authors find delays in development of the corpus callosum, which is a tract of nerve fibres that connect the two hemispheres of the brain. Specifically, the leading front of these fibres shows larger gaps between the hemispheres in the absence of TRIM67. Cultured neurons from this mutant show obvious defects in their ability to change axon direction in response to the extracellular cue netrin. Trim67-/- neurons in culture also do not show extensive axonal branching in the presence of netrin. The authors also describe other cell biological and morphological changes in Trim67-/- neurons in detail, such as growth cone morphologies by scanning electron microscopy and measurement of filopodia lifetime by live cell imaging. They find that Trim67-/- neurons spend less time retracting their filopodia in response to netrin. However, these latter changes are complex and may be challenging for a non-expert to appreciate. TRIM67 is a large multi-domain protein comprising N-terminal tripartite motif domains – a RING domain that confers ligase activity, a B-box domain and a coiled coil domain. Additionally, it contains a COS domain and an FN3 domain that may allow interaction with microtubules and a SPRY domain which typically engages other binding partners. Performing structure-function analysis by expressing versions lacking individual domains, the authors find that all domains participate in the axon-branching response to netrin. To test whether TRIM67 regulates VASP via a direct interaction, the authors overexpressed constructs of TRIM67 and VASP in 293T cells. They found that these proteins interact. The coiled coil domain of TRIM67 is required for this interaction but its ligase activity is not. Live TIRF microscopy of axonal filopodia suggests that colocalization of TRIM67 and VASP is reduced without the coiled coil domain. Rather interestingly, both TRIM9 and TRIM67 interact with the VASP EVH1 domain. TRIM9 was previously shown to ubiquitinate VASP (5). In TRIM67-/- neurons, VASP-Ub levels were increased. Epistasis experiments in this study reveal that the Trim9-/-;Trim67-/- double knockout resembles Trim9-/- in that relative levels of VASP-Ub are lower and number of filopodia per growth cone follows the same trend as Trim9-/-. This suggests that TRIM67 acts in the same pathway as TRIM9 and likely inhibits activity of the latter towards VASP via competitive binding. The combined function of these two Ub ligases contributes to filopodia formation and axon guidance. Working model for VASP regulation at axon tips, provided by the authors. What I like about this preprint: This paper and others from the Gupton lab combine a variety of approaches – biochemical analyses, live cell imaging and an in vivo animal model – to reveal an unexpected pathway of VASP regulation. This study also opens up many interesting new questions for enthusiasts of cytoskeletal regulation. How does the presence of netrin reverse VASP Ub or how are DUBs activated? 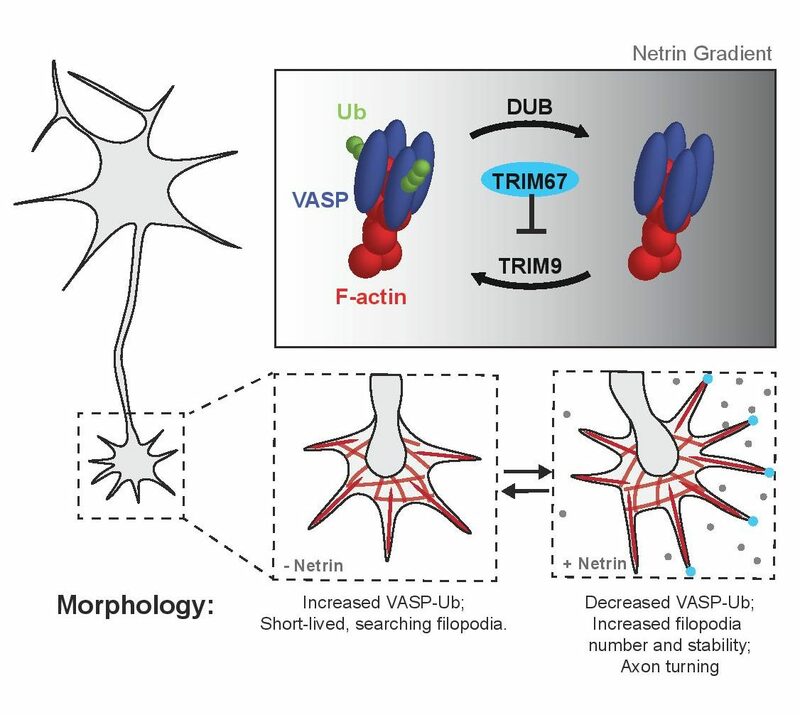 What contributes to increased VASP-Ub in TRIM9-/- neurons in response to netrin (Figure 5F)? Is there a redundant Ub-ligase? Why is the ligase activity of TRIM67 required to rescue VASP-Ub in 293T cells (Figure 5G-H)? Can TRIM9 and TRIM67 heterodimerize? Would you expect TRIM67, TRIM9 and VASP to form a stable or transient ternary complex? Would DCC be part of such a complex? How long are the Ub chains that TRIM9 would typically attach to VASP and would this matter to the mechanism? 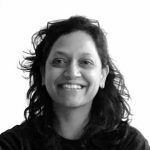 Thank you Angika for the prelight on our work, we are honored, and this nicely summarizes the key findings of our unpublished work. Below, I leave a few comments and respond to your questions. 1. How does the presence of netrin reverse VASP Ub or how are DUBs activated? This is a fantastic question that we don’t know the answer to yet. Unfortunately at this point we do not know the identity of the DUB, so testing its activity, post translational modification state, localization, or other potential means of regulation is not a possibility. An additional hypothesis that we would also like to investigate is that TRIM9 mediated ubiquitination is inhibited specifically in the presence of netrin. Two possible mechanisms could explain this: First, we observed increased localization of TRIM67 to filopodia tips in the presence of netrin, suggesting that TRIM67 is localized to better outcompete TRIM9 for access to VASP in the presence of netrin. Alternatively, since we show that TRIM67 ligase activity is necessary for TRIM67-mediated regulation of VASP but not its interaction with VASP, perhaps TRIM67 negatively impacts TRIM9 function via ubiquitination. (Figure 5F)? Is there a redundant Ub-ligase? Another great question that we don’t have an answer for as yet. We should note that difference in VASP ubiquitination does not reach statistical significance however, and does not appear to the same degree in the double knockout neurons. 3. Why is the ligase activity of TRIM67 required to rescue VASP-Ub in 293T cells (Figure 5G-H)? We would actually interpret this data as the ligase activity is required to rescue the TRIM67-dependent reduction in VASP-Ub. This is a conundrum that a ubiquitin ligase function is needed to reduce ubiquitination, but there are a number of possible explanations, that include, as described above in our response to question 1, that perhaps TRIM67 negatively impacts TRIM9 function via ubiquitination. This putative ubiquitination of TRIM9 would likely be nondegradative, like that of VASP, as we find no differences in TRIM9 protein levels in the absence of TRIM67. 4. Can TRIM9 and TRIM67 heterodimerize? Indeed many TRIM proteins homodimerize through their coiled coil domains, and can heterodimerize, potentially also through coiled coiled domain interactions. In a Figure 4B and 4C of our previous publication (Boyer, N. P., Monkiewicz, C., Menon, S., Moy, S. S., & Gupton, S. L. (2018). Mammalian TRIM67 Functions in Brain Development and Behavior. eNeuro, 5(3), ENEURO.0186–18.2018. http://doi.org/10.1523/ENEURO.0186-18.2018) we observe that endogenous TRIM9 and endogenous TRIM67 interact via co-immunoprecipitation assays, which were performed in both directions. However, additional analytical biochemical studies with purified proteins are required to prove TRIM9-TRIM67 heterodimerization. complex? Would DCC be part of such a complex? This is an interesting hypothesis to test. We would not predict that a monomer of VASP could interact with both TRIM9 and TRIM67 simultaneously, due their overlapping modes of interaction, as revealed by a few observations: First, the N-terminal EVH1 domain of VASP interacts with both TRIM9 and TRIM67, second, the coiled coil domain of both TRIM9 and TRIM67 are required for interaction with VASP, and third the coiled coil domain of TRIM proteins mediates their dimerization. That being said, one could imagine that TRIM9 and TRIM67 could be associated with distinct VASP monomors within a tetramer of Ena/VASP, since the tetramerization domain of Ena/VASP proteins is C-terminal. this matter to the mechanism? Based on the molecular weight shift of VASP-Ub relative to VASP (~24 kDa), this would predict that three ubiquitin proteins are attached to VASP, although we have yet to definitively demonstrate this. Whether these ubiquitins would be arranged in a chain, branched chain, or multiple monoubiquitination is not known. We favor the hypothesis that multi-monoubiquitination of VASP occurs for two reasons. First, monoubiquitination is known to alter protein localization and function, and second, to generate a mutant of VASP which exhibited impaired ubiquitination, we had to mutate several lysine residues to arginine.